212, Classic Physique, Men’s Physique & Pro Wheelchair. The 2018 Arnold Classic and Arnold Sports Festival are Presented by Classic Productions. Celebrating the 30th Anniversary of the IFBB Pro League Arnold Classic and the 12th Arnold Amateur NPC Championships. March 1st - 4th, 2018, Columbus, Ohio. "A massive year of firsts to celebrate the 30 Years of the Arnold Classic." Arnold poses above with the winners of 30 years. Highlights of the IFBB Pro League events this year included Kamal ElGargni who won in his debut appearance in the Arnold Classic 212, Breon Ansley who won the inaugural Arnold Classic Physique, Andre Ferguson who won his biggest IFBB Pro League title to date in Men’s Physique, and Harold Kelley in his third straight Arnold Classic Pro Wheelchair victory. 2018 Arnold Classic Pro Men #1. This 30th Anniversary DVD presents all of the Arnold Classic contest from the Prejudging rounds through to the Finals of the Arnold Classic Pro Men. See the presentation of the Lifetime Achievement Award to Dr Bob Goldman by Arnold. Introduction of the Arnold Model Search contestants and the Overall Arnold Amateur Champions. Plus many extras celebrating the 30 Years Anniversary of the Arnold Classic. 2018 Arnold Classic Pro Men #1 on Blu-ray. This 30th Anniversary Arnold Classic is now preserved for posterity in this DVD of 4 1/4 hours. It presents all of the Arnold Classic contest from the Prejudging rounds through to the Finals of the Arnold Classic Pro Men. See the presentation of the Lifetime Achievement Award to Dr Bob Goldman by Arnold. Introduction of the Arnold Model Search contestants and the Overall Arnold Amateur Champions. Plus many extras celebrating the 30 Years Anniversary of the Arnold Classic - on Blu-ray. 2018 Arnold Classic Pro Men 2 on Blu-ray: 212, Classic Physique, Men’s Physique & Pro Wheelchair. 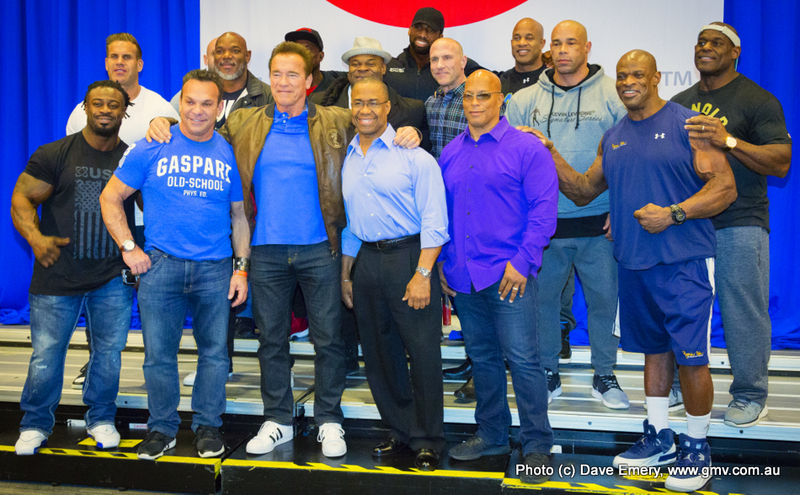 Celebrating 30 Years of the Arnold Classic. Highlights of the IFBB Pro League events this year included Kamal ElGargni who won in his debut appearance in the Arnold Classic 212, Breon Ansley who won the inaugural Arnold Classic Physique, Andre Ferguson who won his biggest IFBB Pro League title to date in Men’s Physique, and Harold Kelley in his third straight Arnold Classic Pro Wheelchair victory. Enjoy the Prejudging and Finals for all classes listed - on Blu-ray. Enjoy the full coverage of this incredible display of skill, power and strength. Split over two days, the competitors battled it out over five incredibly heavy and stressful events. Hafthor Julius Bjornsson of Game of Thrones fame is more than just a character in the movies. “The Mountain” has just shown the world how strong he really is as he emerged the winner of the 2018 Arnold Strongman Classic. Opening speeches by Governor Arnold Schwarzenegger and Jim Manion. We present the Prejudging and Finals of the Arnold Classic 212, Classic Men's Physique, Men’s Physique & Pro Wheelchair. Bronze Sponsors: Arena District, Black Skull USA, Body Engineers BV, BPI, Concept2 CTS, Inc., Einstein Forearm Bench, ELITE Mobility, Gorilla Wear, Jaybird, Magnum Nutraceuticals, Max Effort Muscle, Phit App, Quest Nutrition, Rich Piana 5% Nutrition, ShoulderSphere, Vital Proteins.